It’s the realism of this story that I find so striking. Author E.A. Mann, in his debut novel, wrote something that could hit home with a lot of readers, as there is a focus on the struggles and thoughts we go through during everyday life. Some periods take more out of you than others, and its those that make for the best stories. 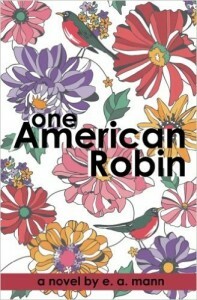 One American Robin picks up with protagonist Robin trying to hold it together while visiting her father, Terry, in the dementia unit at Shady Brook: Partners in Elder Care, where he has been for the past few months. She attends a Sunday brunch (though not every time), along with her sister and her family. There is a seat saved for her mother, who doesn’t have the heart to go. I almost stopped reading after the first chapter. I wasn’t sure that I would be able to handle the emotions involved in reading about a story that focuses on a family dealing with dementia of a loved one. I contacted Mann, who assured me that it’s not all depressing, so I took a deep breath and read on. While some parts focusing on Robin’s interactions with Terry at the nursing home were heartbreaking, others were funny and even sweet. Robin is intrigued with a neighbor and spies on him. He doesn’t leave the house and spends all of his time remodeling his house. This intrigue becomes a crush/obsession and she eventually weasels her way into meeting her neighbor Corey. This leads to her helping him with the remodeling (becoming an apprentice in a way), which eventually leads to them having a unique relationship, which goes in many different directions as Corey’s layers of mystery are washed away. Taking place in Providence in 2009, Tent City (a community of homeless people gathered under the 195 underpass until they were all told they had to move) becomes a character in the story. Robin, following up on a nugget she learned about Corey, makes her way to Tent City and even becomes an historian of sorts. She becomes a confidant of Seril, the mayor, and speaks with residents of the community; spending time listening to and writing down what they have to say. They even give her an honorary tent for nights she decides to stay over. These are the three main plotlines of the story, and Robin tries to balance all three threads in her life. This becomes a struggle, as she isn’t able to devote her full attention to all three at once. Eventually, things all even out and she is able to focus on the things most important to her. Mann has a strong writing style. He gives picturesque descriptions that paint how Robin’s situations are developing. The dialogue is funny and real. He sticks to what people would actually say instead of adding cleverly worded dialogue. His wording is beautiful and he keeps the story moving along, which made it hard for me to put down. My only issue, albeit a minor one, is with the Epilogue. The final chapter provided closure, and I didn’t need the “what are they doing now” summary. The title truly fits with this story, as Robin is the average American. She is quirky, funny, heartfelt and still figuring things out. I feel that these traits are in most people, regardless of age or gender. This is a snapshot of what could have been going through the head of anybody, whether it be the person speeding by you in their expensive sports car or the person struggling to pay for groceries in line at the market. One American Robin served as a reminder to me that we’re not all that different; a powerful thought that I’ve been carrying with me long after I finished reading the last word.